Using your own transaction (invoice) data and P&L numbers, WayPoint Analytics allows you to see the actual profit generated (or lost) from every invoice, customer, territory, product, product line, location, route, vendor, and customer demographic because it costs out your business in precise, granular detail. This is Quantum Costing™, and it provides critical analysis and insights conventional reporting platforms simply cannot give you. Repair, reform, or drop activities and customers that do not — or cannot — make money for your distribution company. With WayPoint Analytics, you can exclusively focus on profit-producing activities. Using WayPoint, you’ll know at the press of a button where your priorities are, without wasting time or continuing practices that do not contribute to your profits. Discover the true profitability of each customer, by territory or the whole company. Quickly identify customers critical to your bottom line and those who destroy your profits. In both cases, you’re in for a surprise. Neither group contains who you’d expect. Make more informed decisions about what you buy and sell. Know which products are profitable and which aren’t. Know which products need a price adjustment or should be bundled. Discover when profit challenges are actually customer-related consequences. Identify the territories that are the most profitable and uncover insights into new sales opportunities. Reform weak or challenging accounts, and take steps to retain your best accounts using retention techniques that demonstrate the benefits of working with your company. Identify and nurture your key relationships and bring your suppliers into the fight for profits. Show your vendors the realities of the market and how they can use their lines to enhance your success. Know how much you’ve spent on transport for each individual customer – even for each individual line item. Create opportunities to reform customers whose shipping costs are too high. Spot opportunities where important customers can purchase more from your line. Gain a greater share of each high-performing customer. Identify chronic customer issues, improve systems, lower costs, and re-negotiate terms with confidence. You can do this. WayPoint can show you how. Exponential profit gains are within reach of any distribution business that takes action on their analytics. See how WayPoint will work for your distribution company by watching this brief demo video. Ready to take the next step in maximizing your profit potential? or call us directly at 480-426-9955 to set up a Q&A and live demonstration. Whatever thoughts or questions you may have about your company’s efficiency, profitability, and cost-to-serve, we’re happy to explore them with you. 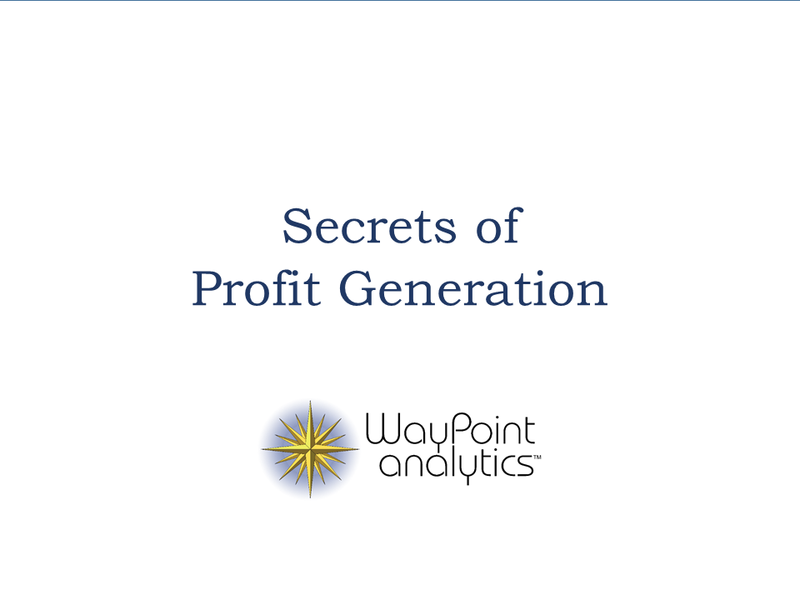 Let us show you how WayPoint Analytics will increase your company’s profitability. By using WayPoint Analytics, and the support from the team they’ve assembled, we have nearly doubled our sales and have increased our net profits to 4-5 times the industry average.